One of the best Bulls we have raised. Deep, thick and super long bodied. Superb in his structure from the ground up. 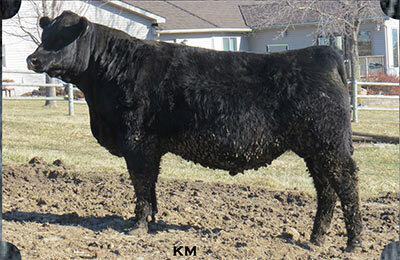 Maternal brother to last year's top seller, KM Mustang 7113 who sold to Woodhill Farms and Cherne Angus. 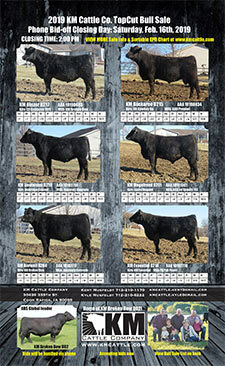 Damage is the #2 pathfinder cow in the breed for $B. Dam records 4 BW @99; 4 WW @ 110; 4 YW @104. High performing bigger framed bull that is a standout. Dam has been a super donor for us. Maternal brother is KM Barnstomer 6017 who was our $12,000 top selling bull in 2017. Dam records 5 WW @ 111; 5 YW @109; 5 IMF @100; 5 RE @103. KM Essential 6003 son that has been a standout since day 1. Dam is a super high performing cow from our Blue Lady cow family. 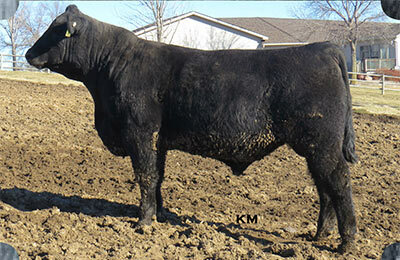 No bull in the breed can match his combination of YW and DMI. YW +113 and DMI -1.15. 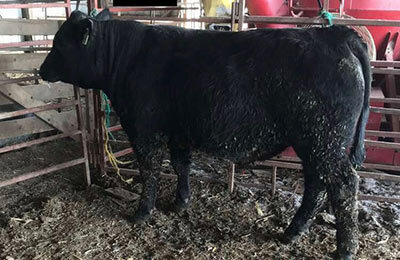 High gaining bull with a RADG EPD of +.42 and recorded an on test gain ratio of 106. Also ranks in the top 15% of the breed for $B. Granddam was purchased from the Feed Efficiency King himself, Dr. Duane Warden. Stout made Colonel son from a super Comrade daughter. He is thick, big boned, and long bodied. Excellent in his structure and feet. 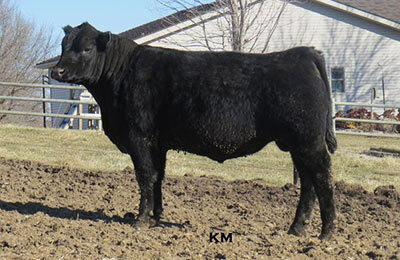 Dam is a maternal sister to KM Banjo 302 who was our top selling bull in 2014 for $9,250 to Kraye Angus Ranch, Mullen, NE. One of the best Broken Bow sons we have raised and our only Broken Bow son in this years sale. 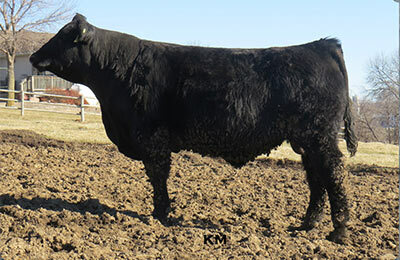 Dam is a full sister to the dam of the 8219 bull above. 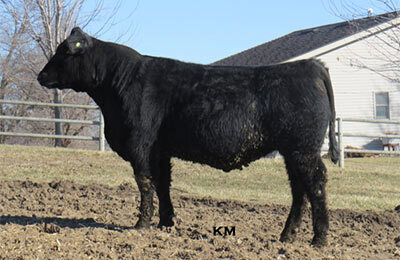 Dam is a maternal sister to KM Banjo who was our top selling bull in 2014 for $9,250 to Kraye Angus Ranch, Mullen, NE.